Senegal has made its biggest seizure of cocaine - about 1.25 tons with a street value of $100m - just a few days after the previous record haul. The drugs were found in the seaside resort of Nianing after an empty sailing boat with 1.2 metric tons was found nearby last week. Six people were arrested on Saturday, leading to the second haul. 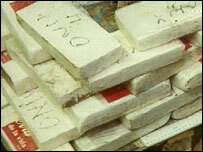 Experts say that West Africa has become a major hub in the trafficking of cocaine from Latin America to Europe. The paramilitary police say they also found two guns in the house where the drugs were seized. Three Senegalese were arrested, along with men from Colombia, Ecuador and Venezuela. Police say they found plane tickets from Brazil to Guinea-Bissau, just south of Senegal, on board the boat, which had been abandoned near Nianing. In April, UN Office on Drugs and Crime head Antonio Maria Costa said he feared Guinea-Bissau could become a "narco-state" following several large cocaine seizures. More than 600kg was seized in Bissau last September but disappeared after being stored in the treasury. Former Guinea-Bissau Prime Minister Aristides Gomes said he had ordered the drugs to be burnt but last week the country's magistrates' union said the correct procedures had not been followed. The judges said they were concerned about the government's alleged role in the drugs' trade. Seven top officials, including former ministers and police commanders, were arrested over the affair but have not been charged. There have also been large cocaine seizures recently in Ghana and Sierra Leone.